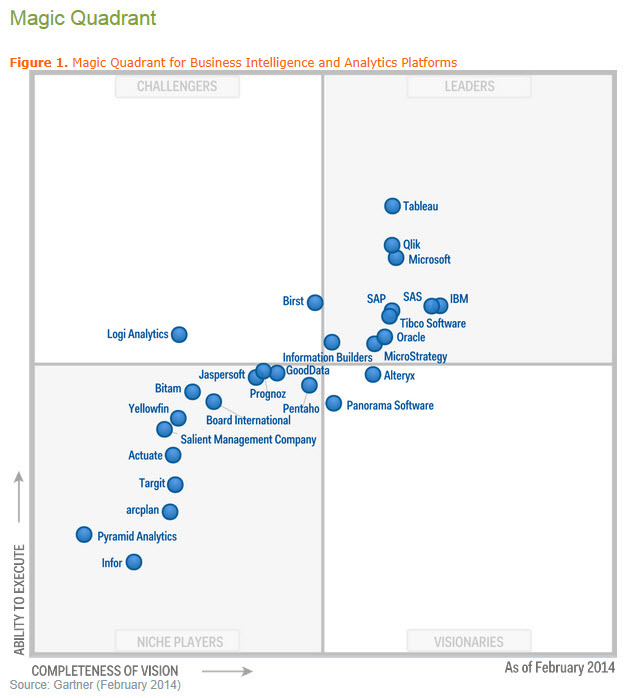 Gartner has just released its 2014 Magic Quadrant for Business Intelligence and Analytics Platforms. I need a few days to soak this in and better comment on it. But, for now, I thought I would share the Magic Quadrant with you. You can see the entire report by clicking here. Gartner describes and defines the market as follows. The BI and analytics platform market is in the middle of an accelerated transformation from BI systems used primarily for measurement and reporting to those that also support analysis, prediction, forecasting and optimization. Because of the growing importance of advanced analytics for descriptive, prescriptive and predictive modeling, forecasting, simulation and optimization (see “Extend Your Portfolio of Analytics Capabilities”) in the BI and information management applications and infrastructure that companies are building — often with different buyers driving purchasing and different vendors offering solutions — this year Gartner has also published a Magic Quadrant exclusively on predictive and prescriptive analytics platforms (see Note 1). Vendors offering both sets of capabilities are featured in both Magic Quadrants. The BI platform market is forecast to have grown into a $14.1 billion market in 2013, largely through companies investing in IT-led consolidation projects to standardize on IT-centric BI platforms for large-scale systems-of-record reporting (see “Forecast: Enterprise Software Markets, Worldwide, 2010-2017, 3Q13 Update”). These have tended to be highly governed and centralized, where IT production reports were pushed out to inform a broad array of information consumers and analysts. While analytical capabilities were deployed, such as parameterized reports, online analytical processing (OLAP) and ad hoc query, they were never fully embraced by the majority of business users, managers and analysts, primarily because most considered these too difficult to use for many analytical use cases. As a result, and continuing a five-year trend, these installed platforms are routinely being complemented, and in 2013 were increasingly displaced, in new sales situations by new investments, and requirements were more skewed toward business-user-driven data discovery techniques to make analytics beyond traditional reporting more accessible and pervasive to a broader range of users and use cases. Also in support of wider adoption, companies and independent software vendors are increasingly embedding both traditional reporting, dashboards and interactive analysis, in addition to more advanced and prescriptive analytics built from statistical functions and algorithms available within the BI platform into business processes or applications. The intent is to expand the use of analytics to a broad range of consumers and nontraditional BI users, increasingly on mobile devices. Moreover, companies are increasingly building analytics applications, leveraging new data types and new types of analysis, such as location intelligence and analytics on multistructured data stored in NoSQL data repositories.